UCSF Benioff Children’s Hospital Oakland already didn’t have enough EVS workers on the job to keep the hospital clean when management announced a rebid that would only make the problem worse. Under the proposed rebid, not only would there be even fewer EVS workers working their shifts, but the reductions would have resulted in 21 workers no longer qualifying for their health benefits. Stripping benefits from hard-working EVS employees was not something NUHW members at Children’s were willing to accept. And, after nearly tripling our strength at the hospital in recent years to 1,400 members, we had the power to push back. 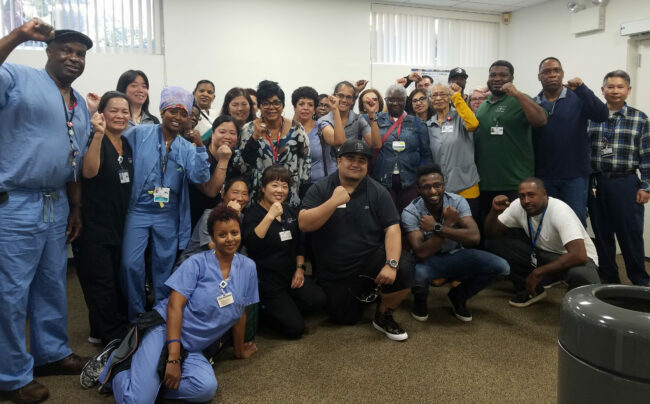 Within one week nearly every NUHW member — along with over 80 doctors and 300 nurses —had signed a petition letting management know that the hospital was already too dirty and that more EVS workers were needed. Furthermore, they made it clear that it was unacceptable for a hospital named after Mark Benioff, the wealthiest man in San Francisco, to strip benefits away from hard-working employees trying to support their families. After several negotiating sessions, we forced management to relent. They agreed that no EVS workers would lose their benefits from the rebid. The final agreement wasn’t perfect — individual EVS workers will be assigned to clean larger areas of the hospital, but our members are already organizing to document any area that isn’t clean so that we can address it with management at upcoming meetings to discuss how the rebid is unfolding.